A Westhill art student has scooped a top prize at this year’s Gray’s School of Art Degree Show. Catherine Ross (22), who is currently studying painting at the art school, was presented with the BP Fine Art Award 2014 after the judges were impressed by her work which draws on her fascination with remote places. She received a specially commissioned trophy alongside a cheque for £500. Born in the rural town of Yellowknife in northwest Canada before relocating with her family to Scotland, Catherine has found her work over the past two years driven by an attempt to capture the anchored feelings that she has towards her birthplace. “I wanted to materialise objects and images that could communicate this personal attachment I have towards far northern places,” she explained. “I also painted to impress the powerful feeling of absence that I feel the ‘north’ as a place holds. 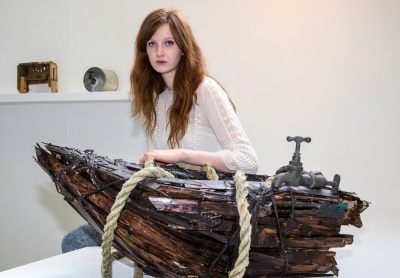 Catherine, who is also one of just 10 UK art students to have been shortlisted for the prestigious Woon Foundation Painting and Sculpture Art Prize, has developed her ideas through the construction of models, paper pieces and paintings simultaneously. Catherine’s work, For the Washing or the Waves?, will be on show at Gray’s School of Art, Garthdee Road, Aberdeen until June 28.